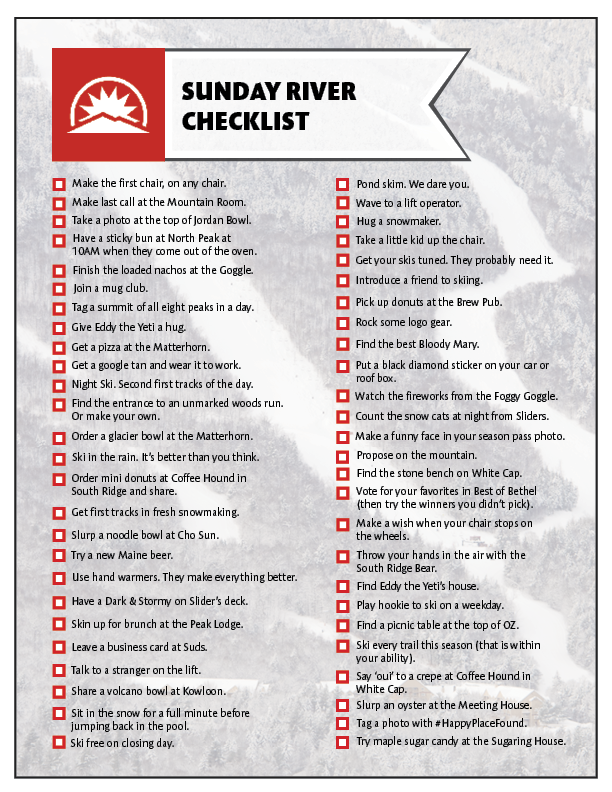 Introducing the Sunday River Checklist. The perfect accessory to a successful day (or season) on and off the slopes, our checklist will help you make the most of your trips to Sunday River and is found on this year’s trail map. From tagging all eight peaks in a day to sipping a glacier bowl at Matterhorn, there’s a lot to experience and explore. We challenge you to try them all. Make the first chair, on any chair. Make last call at the Mountain Room. Take a photo at the top of Jordan Bowl. Have a sticky bun at North Peak at 10AM when they come out of the oven. Finish the loaded nachos at the Goggle. Tag a summit of all eight peaks in a day. Give Eddy the Yeti a hug. Get a pizza at the Matterhorn. Get a goggle tan and wear it to work. Find the entrance to an unmarked woods run. Or make your own. Order a glacier bowl at the Matterhorn. Ski in the rain. It’s better than you think. Order mini donuts at Coffee Hound in South Ridge and share. Get first tracks in fresh snowmaking. Slurp a noodle bowl at Cho Sun. Try a new Maine beer. Use hand warmers. They make everything better. Have a Dark & Stormy on Sliders’ deck. Skin up for brunch at the Peak Lodge. Leave a business card at Suds. Talk to a stranger on the lift. Share a volcano bowl at Kowloon. Sit in the snow for a full minute before jumping back in the pool. Ski free on closing day. Pond skim. We dare you. Wave to a lift operator. Take a little kid up the chair. Get your skis tuned. They probably need it. Introduce a friend to skiing. Pick up donuts at the Brew Pub. Find the best Bloody Mary. Put a black diamond sticker on your car or roof box. Watch the fireworks from the Foggy Goggle. Count the snow cats at night from Sliders. Make a funny face in your season pass photo. Find the stone bench on White Cap. Vote for your favorites in Best of Bethel (then try the winners you didn’t pick). Make a wish when your chair stops on the wheels. Throw your hands in the air with the South Ridge Bear. Find Eddy the Yeti’s house. Play hookie to ski on a weekday. Find a picnic table at the top of OZ. Ski every trail this season (that is within your ability). Slurp an oyster at the Meeting House. Tag a photo with #HappyPlaceFound. Try maple syrup candy at the Sugaring House.